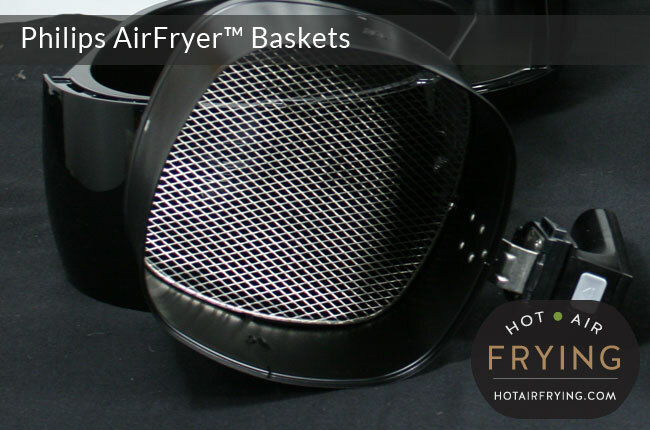 Baskets for Philips AirFryers have black, coated metal sides, and a mesh bottom. They are square with a handle. For the Viva line, the baskets are 19 cm (7 1/2 inches) square and about 8 cm (3 inches) deep. For the Avance line, the basket is larger. Both both the Viva and Avance line of AirFryers, the baskets lock into a hard plastic holder (which some people refer to as a drawer, others, as a tray), which serves both as a holder for the basket, and a drip catcher. You press a button on top of the handle to release the two to separate them for easy cleaning. Make sure not to press that button while you are moving the basket in and out, because that will cause the basket to separate into two pieces in mid-air. Both the basket and the basket holder drawer are dishwasher safe. The black coating on the metal of the basket is not Teflon, but something else. Some consumers have reported that the coating has flaked off of baskets in similar models by other manufacturers, but we have not yet seen any reports of such quality issues on the Philips baskets. To order a replacement basket or basket holder, you need to go to the Philips site for your country, which you can locate here: https://www.sitemap.philips.com/sitemap/ca_en/ . As of fall 2014, the baskets are not on Amazon. Here at HotAirFrying, we’ve attempted to compile a growing list of free online sources for recipes and usage ideas. That list is here: https://www.hotairfrying.com/philips-airfryer-recipes/ . Hope that helps. I have bought Philips air fryer basket.l thought that was the whole hot air fryer.lwish to return it but not clear who l return it to .please help.